A body polish is an ideal way to pamper yourself. This body treatment not only exfoliates but also hydrates your skin to make it soft and smooth. Think about it as a facial – but for your body. Don’t worry, you don’t have to splurge at a spa for this. Body polishers can be used within the comfort of your home, and anytime you’re in the mood for an instant pick-me-up. Check out below the 10 best body polishers that you must try this year. The smooth and glowing skin you’ve always desired is just a click away! Read on. 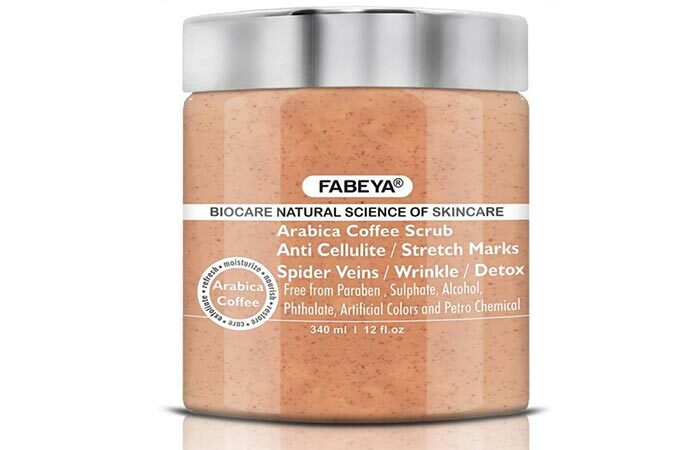 Fabeya BioCare Natural Arabica Coffee Body Scrub and Polish claims to remove dead skin and wrinkles from your face and body and make you feel fresh and bright. The coffee extracts give you a glowing face and lightened skin tone. This body polish helps exfoliate dead skin cells and cellulite, which, in turn, prevents the appearance of premature wrinkles and other signs of aging. 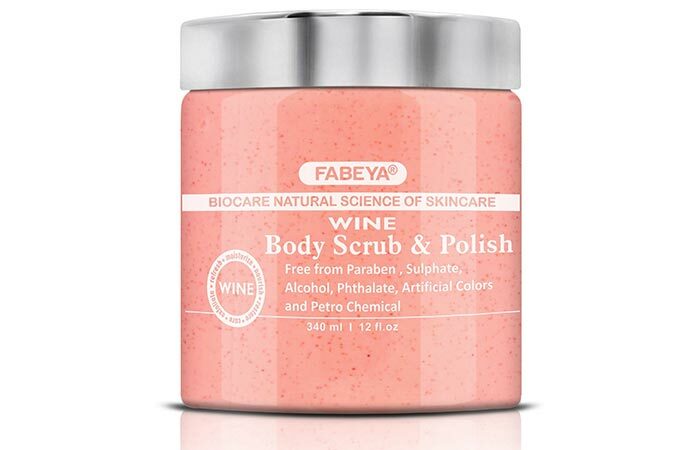 Fabeya Wine Body Scrub And Polish is enriched with the antioxidant properties of wine, which help in flushing the toxins out of the skin. The natural ingredients in this body polisher cleanse, nourish, and moisturize your skin to make it soft, fresh, and radiant. It detoxifies and rejuvenates your skin all over. Regular use makes your skin feel lightly scented, smooth, and moisturized. 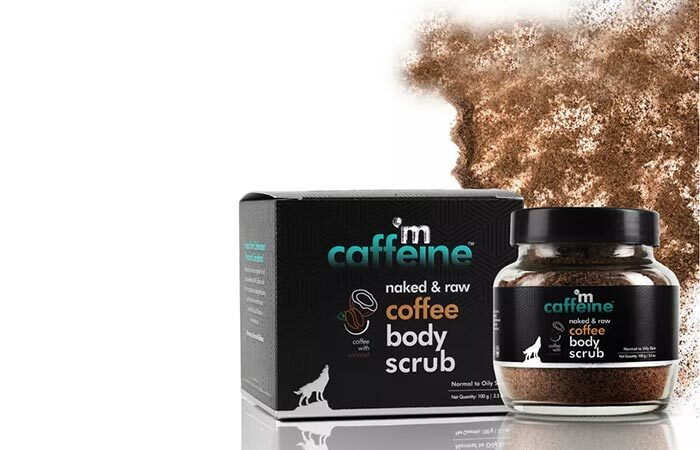 MCaffeine Naked & Raw Coffee Body Scrub is made using the goodness of coffee and coconut. Coffee polishes your skin, stimulates blood flow, and reduces cellulite. The caffeine in coffee evenly tones the skin and reduces puffiness. Coconut deep cleanses, hydrates, and reduces stretch marks to nourish your skin deeply. The exfoliating body polisher scrubs away all the dead skin cells, blackheads, impurities, pollution, and unwanted tan. 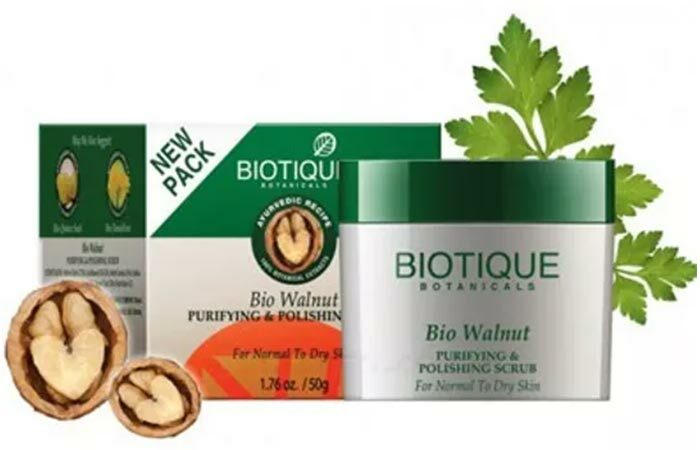 Biotique Bio Walnut Purifying & Polishing Scrub contains walnut oil, which is rich in Vitamin A and Lecithin. Extracts of neem, mint, fenugreek, and red sandalwood replenish your skin and fade fine lines and other signs of early aging. 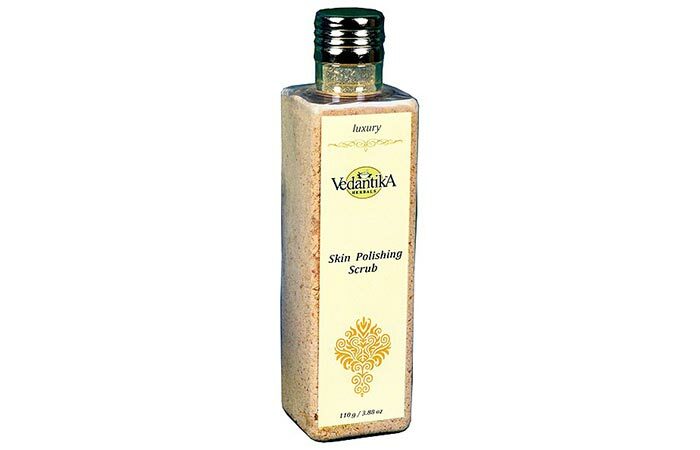 The exfoliating granules in the body polisher help to slough off dead skin. Regular massage also boosts the blood flow to your skin’s surface and drains your lymph nodes. 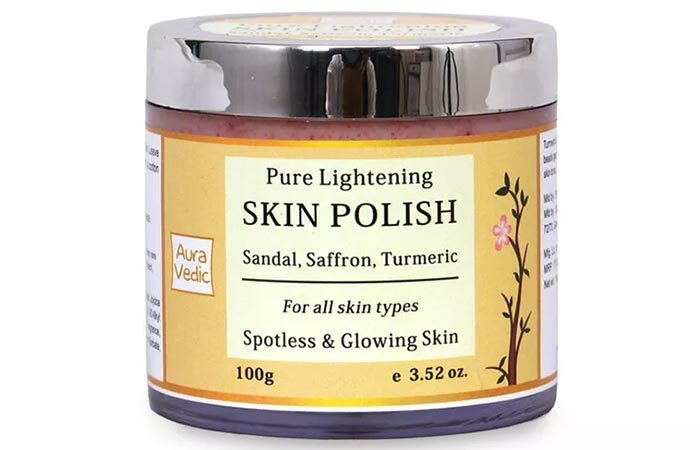 Auravedic Pure Lightening Skin Polish scrubs away UV damaged cells with deep yet gentle exfoliation to reveal clear skin. It evens out your skin tone and makes it smooth and glowing. It contains saffron, turmeric, and sandalwood, which lighten dark spots and diminish pigmentation marks, while jojoba beads gently buff away dull, tanned, and dead skin. 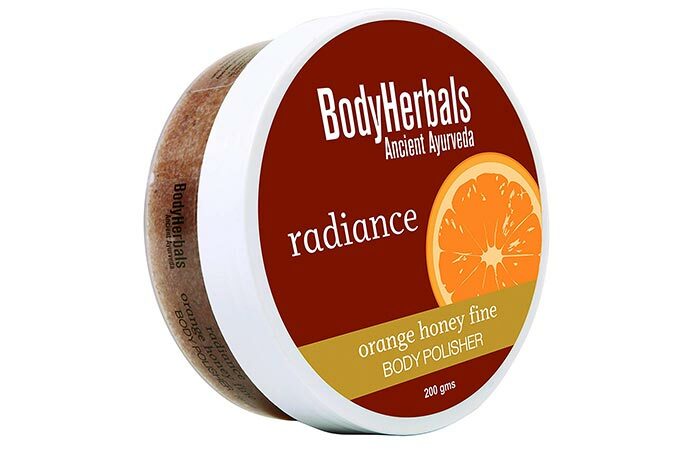 The BodyHerbals Radiance Orange Honey Fine Body Polisher combines the goodness of natural essential oils and pure herbs to cleanse your body like nothing else. It exfoliates your skin using fine, minute crystals that keep it smooth for the longest time. The fresh orange and honey fragrance in the formula adds to the natural aroma of herbs. Orange extracts nourish your skin with vitamin C and lighten your skin tone. 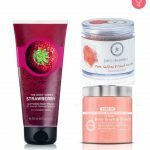 The Body Shop Strawberry Body Polish smoothes and softens your skin by gently buffing away dead skin cells. Regular use makes your skin feel silky-soft and nourished with long-lasting moisture. This body polish is made from cold-pressed strawberry seed oil and honey. Strawberries are rich in vitamin C and antioxidant compounds that help to protect and nourish the skin. It also contains salicylic acid, which has good pore-cleansing properties. Vedantika Herbals Ayurvedic Skin Polishing Scrub is formulated with potent herbs, nuts, and pulses for a perfectly rejuvenating experience. It contains the natural goodness of ashwagandha and sweet almonds that have antibacterial and antifungal properties. It cleans clogged pores and prevents recurrence of acne and bacteria. The scrub gently exfoliates the skin of dirt, debris, germs, and dead cells, leaving behind bright and soft skin. 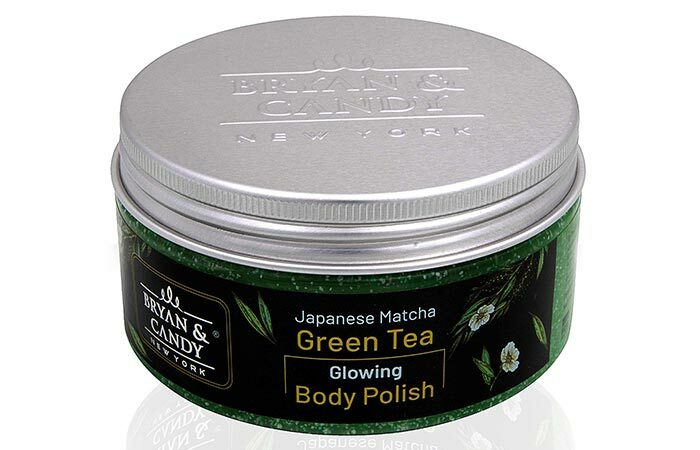 Bryan & Candy New York Green Tea Body Polish contains microcrystalline cellulose that can be used to exfoliate dead skin cells from the body gently. These microbeads unclog the pores and remove tan. It contains aloe vera and marigold extracts that keep your skin hydrated and healthy. The green tea leaf extract provides a strong antioxidant effect that protects the skin from the damaging effects of free radicals. 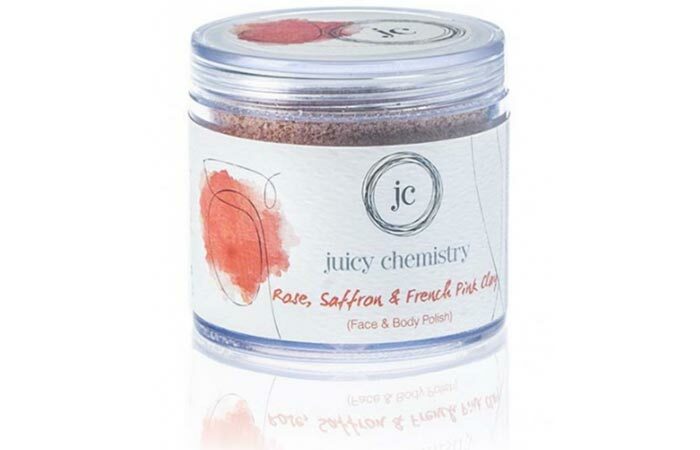 Juicy Chemistry Rose Saffron & French Pink Clay Face & Body Polish has powerful anti-aging properties that help restore and enhance your complexion. The gorgeous-smelling rose and rich Kashmiri saffron leave your skin smooth and deeply nourished. Rose, a potent ingredient for skin rejuvenation, gently soothes sensitive, damaged skin. The exquisite Kashmiri saffron acts as a beautiful skin-brightener and a natural toner. These are the best body polishers that you can use to get the soft, clean, and nourished skin of your dreams. Which of these will you pick to pamper yourself? Let us know in the comments below.